Size of this type is 712 bytes (on a 64-bit architecture). Definition at line 34 of file ndn-consumer-cbr.hpp. Definition at line 66 of file ndn-consumer-cbr.cpp. Definition at line 74 of file ndn-consumer-cbr.cpp. Definition at line 40 of file ndn-consumer-cbr.cpp. References GetRandomize(), m_frequency, ns3::ndn::Consumer::m_seqMax, and SetRandomize(). Definition at line 79 of file ndn-consumer-cbr.cpp. References m_firstTime, m_frequency, m_random, ns3::ndn::Consumer::m_sendEvent, and ns3::ndn::Consumer::SendPacket(). Set type of frequency randomization. Definition at line 95 of file ndn-consumer-cbr.cpp. References m_frequency, m_random, and m_randomType. Get type of frequency randomization. Definition at line 114 of file ndn-consumer-cbr.cpp. Definition at line 69 of file ndn-consumer-cbr.hpp. Referenced by GetTypeId(), ScheduleNextPacket(), ns3::ndn::ConsumerZipfMandelbrot::ScheduleNextPacket(), and SetRandomize(). Definition at line 70 of file ndn-consumer-cbr.hpp. 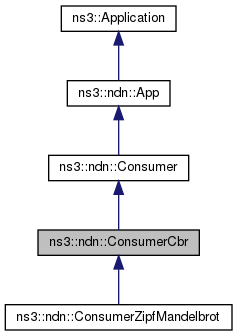 Referenced by ScheduleNextPacket(), and ns3::ndn::ConsumerZipfMandelbrot::ScheduleNextPacket(). Definition at line 71 of file ndn-consumer-cbr.hpp. Referenced by ScheduleNextPacket(), ns3::ndn::ConsumerZipfMandelbrot::ScheduleNextPacket(), and SetRandomize(). Definition at line 72 of file ndn-consumer-cbr.hpp. Referenced by GetRandomize(), and SetRandomize().